Wood to Steel Screws Are Specifically Designed For Fastening Plywood And Other Wood Products To Aluminum. 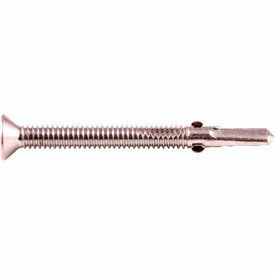 Wood to Steel Screws are made of steel for long lasting durability. Specialized self-drilling fastener and reamer wings drill through the wood layer and snap off on contact with steel or aluminum to provide optimum performance. Sizes are #10-16, #12-24 and #14-20. Drive sizes are T25 or T30. Head diameters are .38", .42" and.461". Drilling capacities and lengths vary per model.